I archive photos, I archive photos like mad. :-) That's a serious hobby leave it. Browsing the archive I noticed this series of cakes I tasted. I wish I had all the *other* cake snaps too. Trust me this is only 10% of the total cakes I would have tasted. Cake walk, Just bake are some of the outlets in Bangalore we regularly knock into. This is one of the special cake. Its a White Forest. We got this for our college farewell. 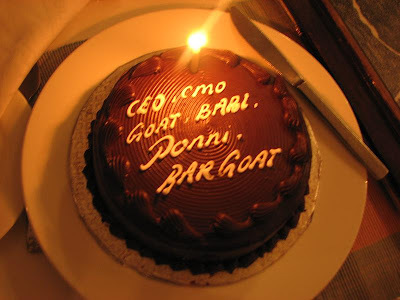 But fortunately the guy (Mr.Gethu) stacked the cake vertically. That's why you can see both the sides tapered and the cake looks oval in shape. This was for my class PR. That guy fortunately had fever to escape from the bums that year. Unfortunately I don remember the flavor. 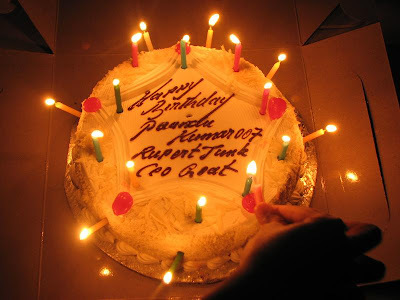 This was one of the three cakes of my previous Birthday! :) It was a Black Forest. 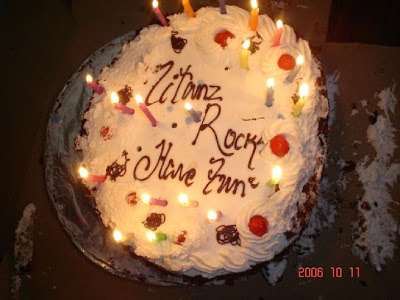 I wonder what all people imagine to write on the cakes. This cake was the heights! Its a Pineapple Flavor. 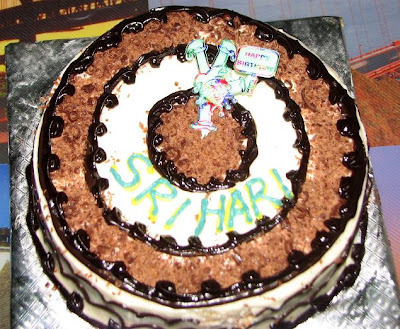 Look at the essay writing on the cake. The vendor would have been sigh on getting this done. See how many candles, I guess the Birthday boy would have been burnt before he blew them off. There are many others! I'm not remembering many of them. OMG !!! Vijesh is our Database for storing photos. Guys do you need any sent a select query to vijesh to retrieve them for you. Am going to send one across to vijesh now. SQL Syntax Error after WHERE clause. Condition Needed! @Srihari & Vijesh: Tch tch tch!! These coding guys!! They need to go get a life! 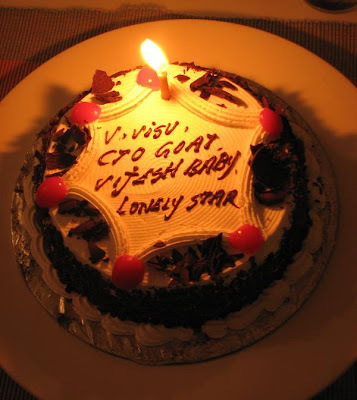 @Vijesh: I feel like cursing you for this post. You know, THAT 'curse'. Here I am,sitting all hungry and you have this post :( *sigh* Unfair world! Do you remember the photo??? http://photobucket.com/ is also very good. I saw that the Trial a/c is free & it gives 10GB space. http://photobucket.com/upgrade - this is where Flickr beats it. Problem with Photobucket is the images will be resized to 1024x768 which is less when compared to latest high resolution monitors. So when you download them back they are small. - In Flickr the images are stored in Actual size, be it any resolution and you can download back in the same resolution. Also there is a restriction on size of the photo to 2mb! oh ok , you know better. I did not know that , i leave it to you.